For a second year we are seeking to appoint an Organ Scholar to assist the growth of our flourishing music department at St John’s. We are an inclusive liberal catholic church in communion with the Church of England, and our Organ Scholarship is ideally suited to a young musician seeking to develop their church musicianship skills in a supportive and challenging environment. Our Inaugural Scholar, James Hendy, went on to become Organ Scholar at Robinson College, Cambridge, and we are currently seeking a talented and enthusiastic young organist to be his successor. 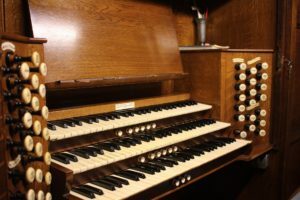 Working with our RSCM-affiliated choir and under the guidance of our Director of Music, the Scholar will receive a comprehensive grounding in the skills of an accomplished church organist, from developing confidence in improvising short pieces and Plainchant accompaniment, through to accompanying a choir with flair and sensitivity. Opportunities are available for candidates who wish to grow in confidence as recitalists or choral conductors, and the church will support the Scholar in going on to develop their career in church music. Applications are currently being accepted until Sunday 31st March. For further information on how to apply, please read our application pack below.